2018 has started off on a wacky note weather-wise. From frantic flurries to warm weather oddities, this winter season will be one to look back upon as one of the most peculiar for the region. Here in Rockland and in surrounding towns, superintendents are in charge of making some pretty tricky decisions when it comes to determining snow days. When the snowstorm started early on Tuesday morning, Jan. 30, students, parents, and teachers wondered, “Will school be cancelled?” To the dismay of many, school was never cancelled or delayed that morning, while the 2-4 inches that was predicted turned into 6-8 inches. 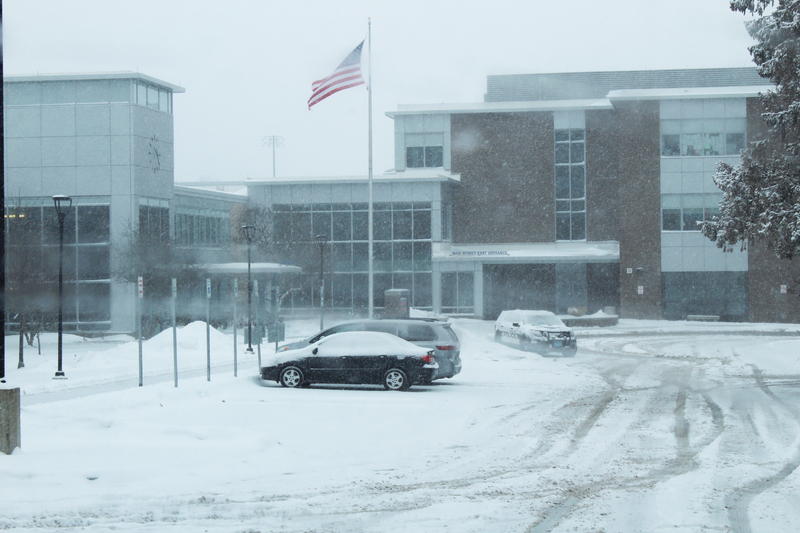 Many Rockland citizens and faculty were left rather confused or angry about having to send their kids to school with such a large amount of snow falling at such a rapid rate. Many parents and staff members were also confused and agitated, especially when finding out about the number of motor vehicle accidents reported in Bridgewater, Easton, and Whitman. In Whitman, a school bus crash sent four children to the local hospital with non-life-threatening injuries. When it comes to making the call, it ultimately falls into the hands of Dr. Cron who detailed the process he and most superintendents use. He said that the night before he checks in with the Taunton Weather Service which gives him and the superintendents of surrounding towns the most accurate and timely forecast of the weather for the morning. If the upcoming storm is forecast to cause troubles getting to school, homes get a call the night before. If not, then the morning of he gets in contact with Highway Department Director, Dave Taylor who gives a 5 a.m. report to determine the conditions of the roads. When making the report, the safety of the kids and buses is the main concern for both Dr. Cron and Taylor. After receiving the report, Dr. Cron takes to his email to evaluate the conditions, the forecast, and safety considerations with other superintendents. This is when they try to decide as a whole if it is in the best interest of their towns to cancel or delay school. Dr. Cron noted the superintendents like to keep each other informed and also try as much as possible to stick together. In particular, Dr. Cron keeps in especially close contact with the superintendent of Abington when it comes to making these decisions. Regarding the last snow storm, Dr. Cron calls it“the scariest day” he’s had as a two year superintendent when it comes to making the call. The snow forecast projected only 2-4 inches, but it turned out the total snowfall ended up nearing 8 inches in some locations. At 5 a.m., when most of the calls are typically made, the snow was still projected to be minimal and the conditions were reportedly fine. When the snow started to pick up around 6:45 a.m., busses were already out making their rounds. At that point, Dr. Cron explained it was too late for a delay. He added, even if a delay had been made it would not have made a difference since the snow continued to fall throughout the morning. In the end, all Rockland Public School students made it to their schools safely; and by dismissal, the snow had stopped and the roads were cleared for a safe commute home. Dr. Cron says that after the revised snow totals developed, he could only nervously hope that everyone would exercise caution on the roads.